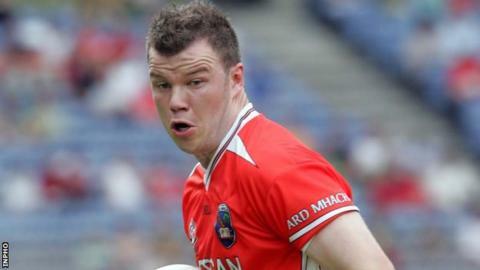 Former Armagh GAA star Ronan Clarke is now said to be "stable and in recovery" in Craigavon Hospital after being injured in a club game on Friday night. Clarke, 32, is being treated after sustaining a head injury. Wednesday's latest update follows the previous assessment which said he remained in intensive care and in a serious condition. The player's family has said that he has been woken from a medically-induced coma and has spoken a few words. An Armagh GAA statement on Tuesday night said that there had been "an improvement in his condition". "He's still not out of the woods and continues to need your prayers, but he has taken a small step in the right direction," said the Armagh statement on the county's Facebook page. "His family have been made aware of the thousands of people, not only from Armagh and indeed Ireland, but from right across the world that have sent messages of support and best wishes. "To everyone that has taken the time to send those, his family are eternally grateful." The 32-year-old is understood to have sustained a head injury after colliding with a goalpost while playing in Friday night's game between his club Pearse Og and Maghery.